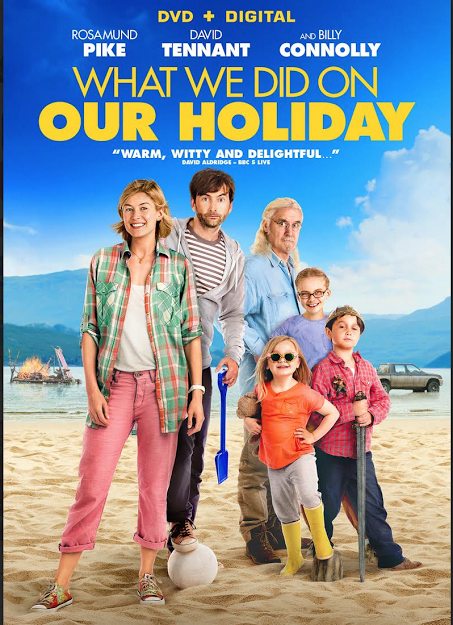 SANTA MONICA, CA (July 27, 2015) – A trip to the Highlands reveals more than one family desires when the entertaining and uplifting comedy, What We Did on Our Holiday, arrives on DVD October 6th from Lionsgate Home Entertainment. The film is currently available On Demand and on Digital HD. Starring Academy Award® nominee Rosamund Pike (Best Actress, Gone Girl, 2014), David Tennant (BBC’s “Dr. Who”) and celebrated comedian Billy Connolly (The Hobbit: The Battle of the Five Armies), this story of one family’s journey through an unforgettable summer vacation was named “Best Comedy” at the inaugural UK National Film Awards in 2015. A heartwarming film, perfect for the whole family,theDVD includes audio commentary with the directors, a behind-the-scenes featurette and deleted scenes. The What We Did on Our Holiday DVD will be available for the suggested retail price of $19.98. Title Copyright: © ORIGIN PICTURES (OUR HOLIDAY) LIMITED / BRITISH BROADCASTING CORPORATION 2014.